The Machane Yehuda Market, or shuk, is the largest market in Jerusalem with over 250 vendors selling everything from fruit and vegetables to specialty foods, and clothing to Judaica. The market is the main ‘traditional’ marketplace of Jerusalem contrasting with the supermarkets that are found across this city, just as any other advanced city. Machane Yehuda is, however, an experience for a tourist of a traditional Middle Eastern style shuk, a fascinating array of sounds, sights, and smells. 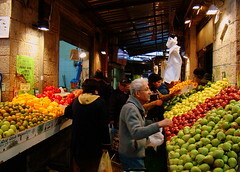 The Machane Yehuda Market is set between Aggripas and Jaffa Streets, with two main aisles and then many further small walkways once inside. It is a maze and myriad of sights, sounds, and smells, an intense sensory experience and memorable life experience! 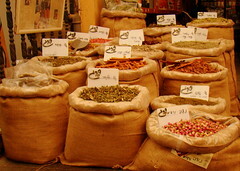 Just a ten minute walk from the center of Jerusalem, the market is a fascinating place to stroll whether you are interested just in observing the magnificent sculpted displays of spices, mouthwatering array of foods, and stunning energy of the place, or if you want to get involved in real-market buying, negotiating and tasting! The shuk is open every day apart from Shabbat, and is particularly busy on Thursdays and Friday mornings with shoppers preparing for the Sabbath. If you are particularly interested, it is possible to take a walking tour followed by a cookery class every week – read more about the Machane Yehuda Market tours.